With summer starting to lose it’s grasp on most of the country, many people are thinking about brewing gifts for Christmas and other holidays. Some people have asked me if there is still time to make mead for the holiday season. The good news is that you can turn around a mead in two to three months, so you will be able to just squeeze it in. There are a couple of different tactics to can take on this. First is a straight up traditional mead. Doesn’t sound very exciting I know, but a well made clean semi-sweet mead is a thing of beauty. You could also do a melomel, but most of the good fruit is past it’s prime. The final option is a metheglin (spiced mead) of some sort. The best thing about a metheglin is it is not dependent on the season and you can use honey that is more common and therefore cheaper. You could use tupelo honey in a metheglin, but why? Plain Jane clover honey, or whatever is cheap where you live will work just fine.Honey plays well with a wide spectrum of spices so you should concentrate on spices that evoke the season that you want. To me Christmas time is about warm spices like those in gluhwine (German mulled wine). But those are also tricky because they can cross the line from not enough to too much very quickly. Spices should go in the secondary after fermentation is complete and the mead should be tasted every day to see how strong the flavor is. Having a sweet mead will help the expression of the spices and can even make a cloying mead less so. If you are serious about mead, buy yourself a copy of “The Compleat Meadmaker,” by Ken Schramm. The book goes through the process and includes lots of suggestions about ingredient amounts. 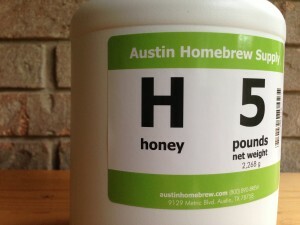 Here is a simple mead recipe that should get you going. Blend the DAP and Fermaid K together in a sealed container. Put 1 teaspoon (5 mL) of the blend into your fermentation vessel along with the calcium chloride, if needed. Add 1/2 gallon (2 L) carbon filtered water and stir. Keep track of how much volume you are adding to the container. Add the honey and use more carbon filtered water to rinse out the containers. Bring the water to half of the final volume and blend thoroughly. The honey will be easier to incorporate if you thin it out before final volume. Add the rest of the water, blend and take a gravity reading. This is important to monitor the fermentation progression. Pitch your yeast, and allow to ferment at ideally between 64–66 °F (18–19 °C). A quick note about gravity readings; I say gravity because that is the term everyone else uses but I actually take Brix readings and convert back to gravity. I converted over to a refractometer for mead making quite a while ago and have never looked back. The advantages are that you only need a few drops, the temperature doesn’t matter as that small a volume equilibrates with the device quickly, most have automatic temperature compensation (ATC) anyway, and finally it is more sanitary because you are not putting the must into a container and then pouring it back. They aren’t that much and they don’t go out of calibration the way hydrometers do. After 24 hours you should see some yeast activity, but don’t worry if you don’t. Stir the must thoroughly to de-gas. The best tool for this is called a wine whip. You do this to release the carbon dioxide, which inhibits the yeast. Take a gravity reading (optional, but if you have a refractometer it’s only a drop or two). De-gas at least once a day, and add nutrients every other day until you have used them all. Continue to de-gas as long as there is active fermentation, which is more than one bubble every second. When it stops bubbling more than once every two — three seconds rack to secondary. When you do add the conditioners and let stand at least 48 hours before you do anything else. The easiest way to add the conditioners is to add them to the bottom of the new carboy and rack on top of them. The swirling liquid will help blend them into the full volume. If all has gone well this should be within a month. Now you can add your spices, I like using a hop sack to keep them all contained. It should take 3-5 days to get the flavor you want. But as I said taste it every day and when the flavor is what you like, take out the spices. You can really use any spices that you want, but remember that both water and alcohol will extract flavor so it takes less than you think. Especially for stuff like cloves and star anise. When the gravity is the same 7 days apart you can package. If you want a carbonated product, I would recommend force carbonating and packaging with a counter pressure filler. I have not played with naturally sparkling mead enough to give you an exact process. But I will tell you that bottle bombs are nothing to play around with. You could use this same base mead for melomels. Fruit addition rates start at 3 pounds per gallon depending on the fruit. Cane berries, like raspberries and especially black berries can have a lot of tannin in the seeds so taste frequently to avoid extracting too much astringency. I like to freeze my fruit prior to adding to mead because this breaks down the cell walls and make more of the fruit available to the mead. I also add a teaspoon of pectic enzyme with the fruit to help it break down. Some fruit should be peeled, especially peaches, but I don’t bother with plums or nectarines. Putting your receipt to the test for a spiced Christmas mead in 2018. Wish me luck. Thanks for the share. Instructions are detailed enough to use.